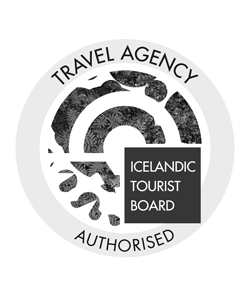 Secret Lagoon Iceland is situated within the Golden Circle route making it very easy to combine both attractions. 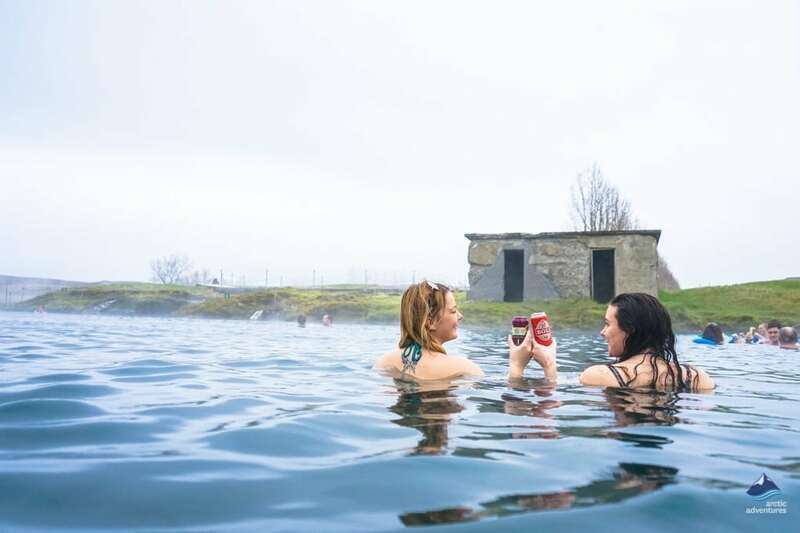 What could be better than visiting three of Iceland’s most famous natural wonders followed by a relaxing bathe in a warm pool? Where is the Secret lagoon located? How to get to the Secret Lagoon? Where to Eat near the Secret Lagoon? 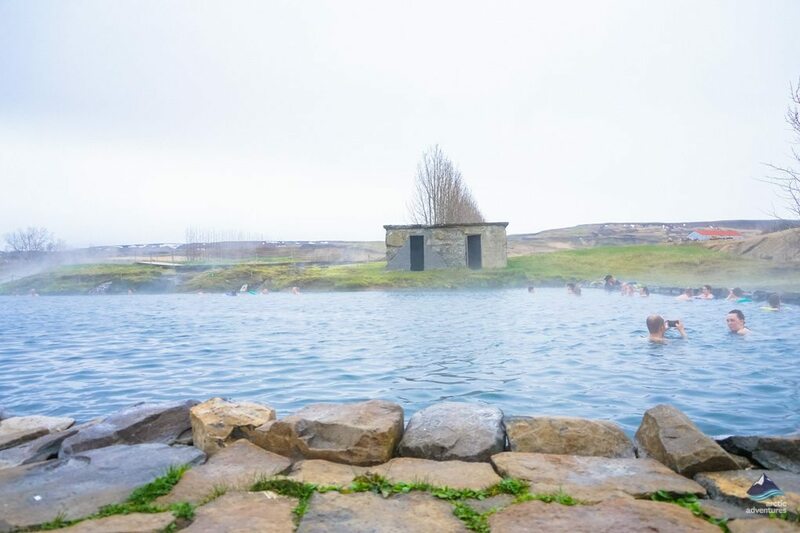 The Secret Lagoon is a beautiful thermal pool located in the small village of Flúðir in the heart of an area with high geothermal activity. 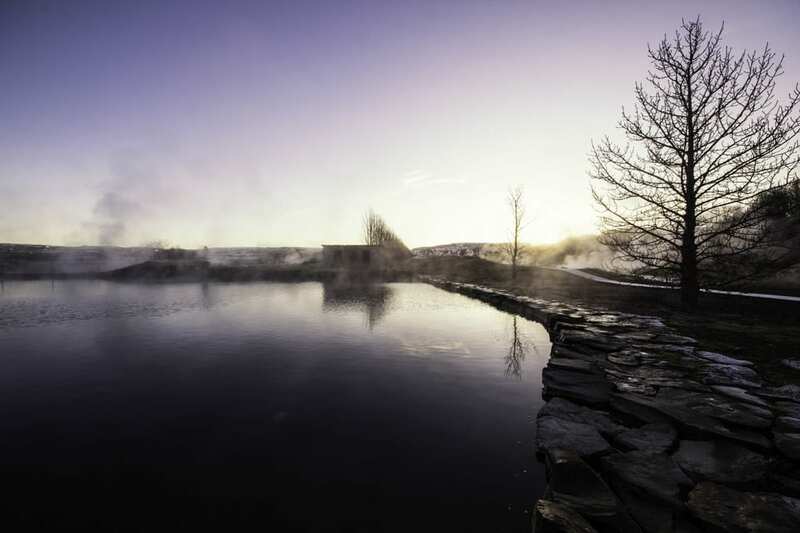 The landscape around the pool is very geothermally focused with steam rising from the hot springs all around giving anyone who visits a surreal and mystical feel. 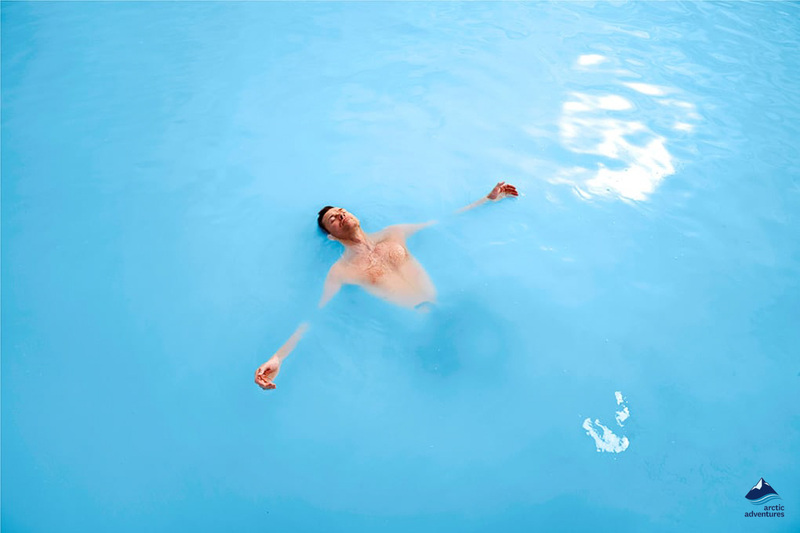 The thermal pool is maintained at a constant temperature of 38/40 °C – lovely to experience at any time of year. 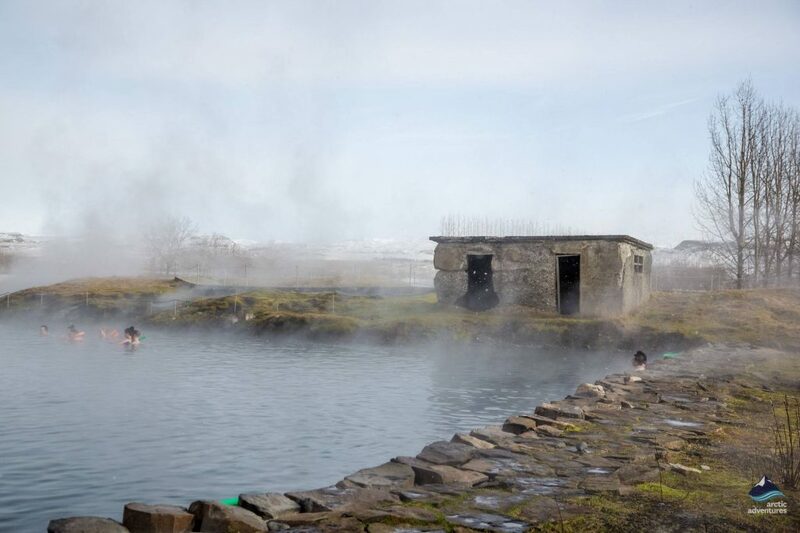 Little pathways, geothermal hot spots and a small geyser, which erupts around every five minutes, are added attractions adjacent to the pool. 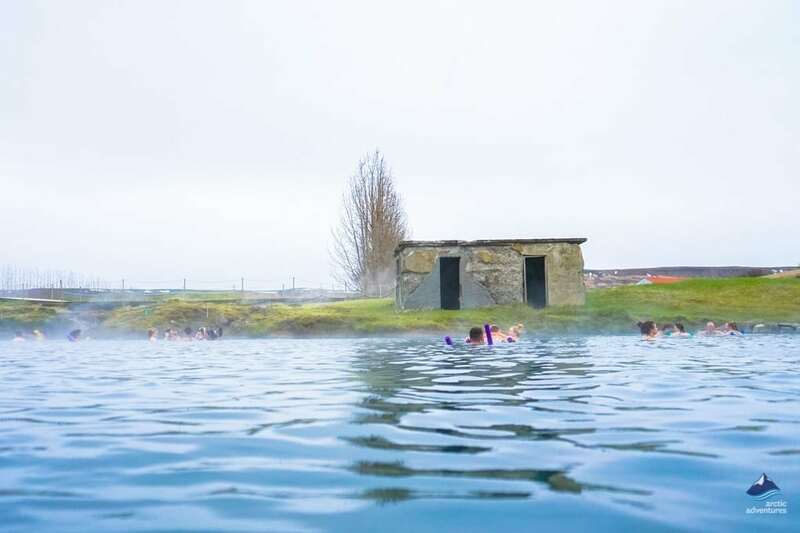 The pool, which is the oldest swimming pool known in Iceland has a tiny two-doored shack standing right above its northern brim adding a finishing touch to the unique setting. This was once the changing room but thankfully that has been upgraded today. 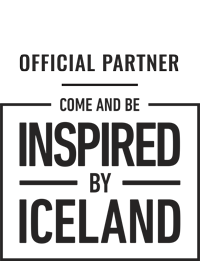 Now you will find lockers, comfortable changing rooms, and showers, a bar and eating areas. You cannot afford to miss this hidden gem! 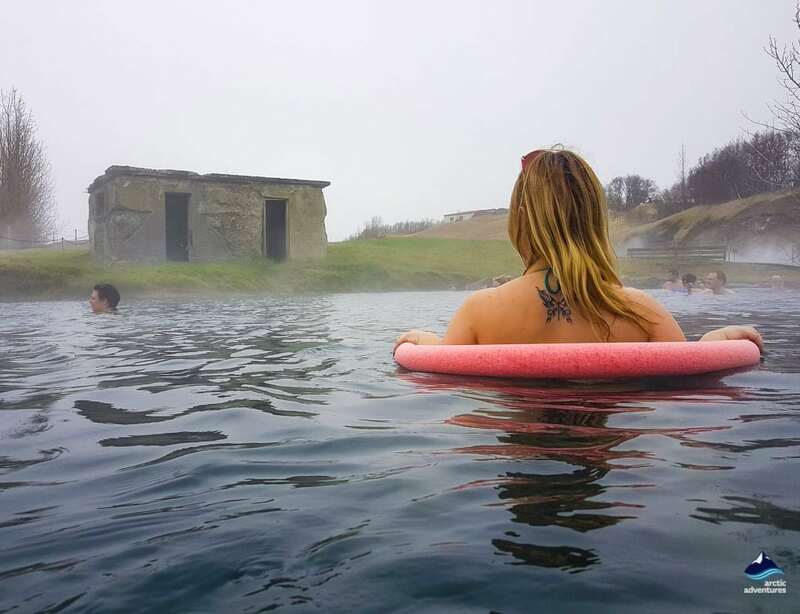 Secret Lagoon is known to most Icelanders as “Gamla Laugin” which means The Old Pool. But before the rise in tourism not so many people knew about it, and thus, this pool also became known as The Secret Lagoon. The pool was created in the year 1891 and in 1909 the first swimming lessons were taught in the pool. 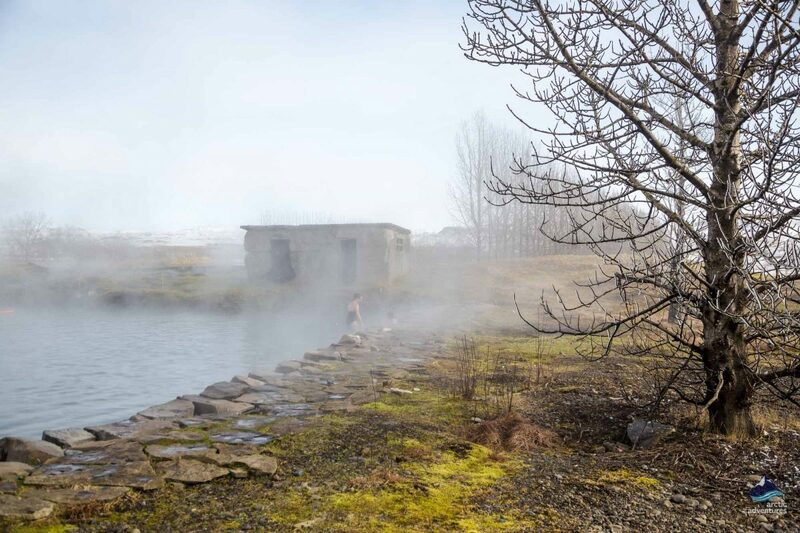 You can only imagine how much the pool richened the life of Flúðir’s inhabitants and opened up opportunities to enjoy a good soak, a welcomed breather from all the hard labor. 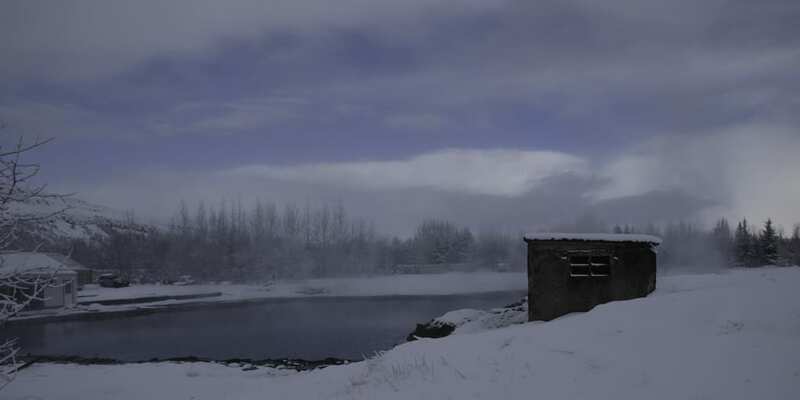 In 1947 a new swimming pool was opened in the town of Flúðir and after that our beloved pool was mostly forgotten. 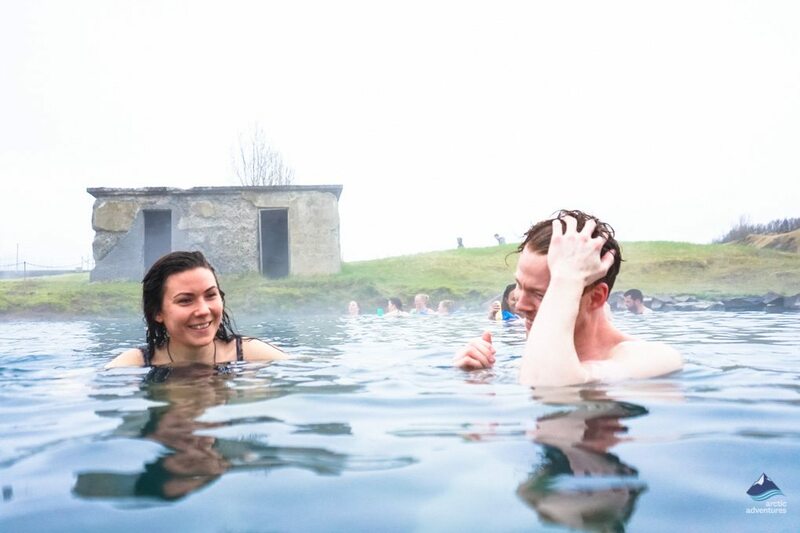 It wasn’t until after 2000 that people started to think of the pool again which today is one of the most sought-after attractions in Iceland. The pool has been fixed since 1891 but the goal has always been to maintain its original appearance and if you compare photos the mission has been quite successful! 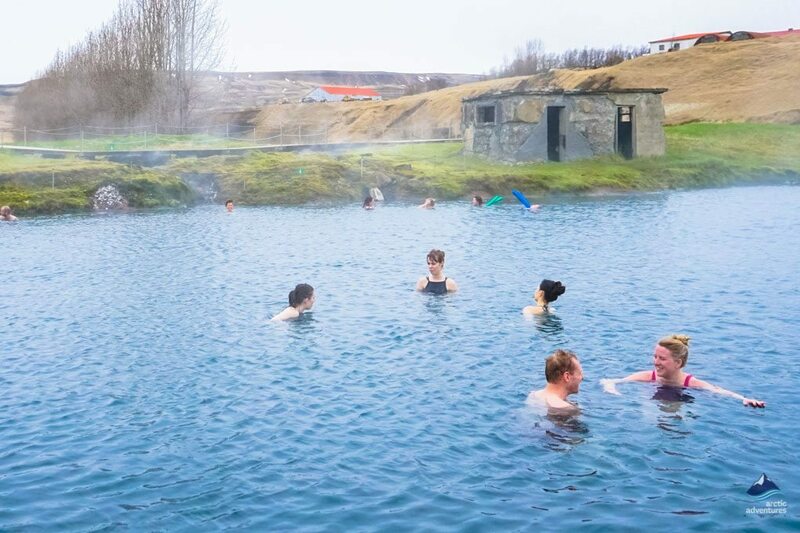 The Secret Lagoon is at Flúðir in South Iceland 97.5 kilometers (60,5 mi) from Reykjavík and about 47 kilometers (29,2 mi) from Selfoss right on the Golden Circle and is a fabulous add-on when doing this famous tour. Nearby places of interest also include Friðheimar Tomato and Horse Farm at Reykholt and Skálholt Historical Church Site. You can easily get to the Secret Lagoon by joining one of our Secret Lagoon Tours (see below) or you can grab a rental car and go on a self-drive mission to visit. Driving from Reykjavík to the Secret Lagoon should take about an hour and a half if you go without stopping. 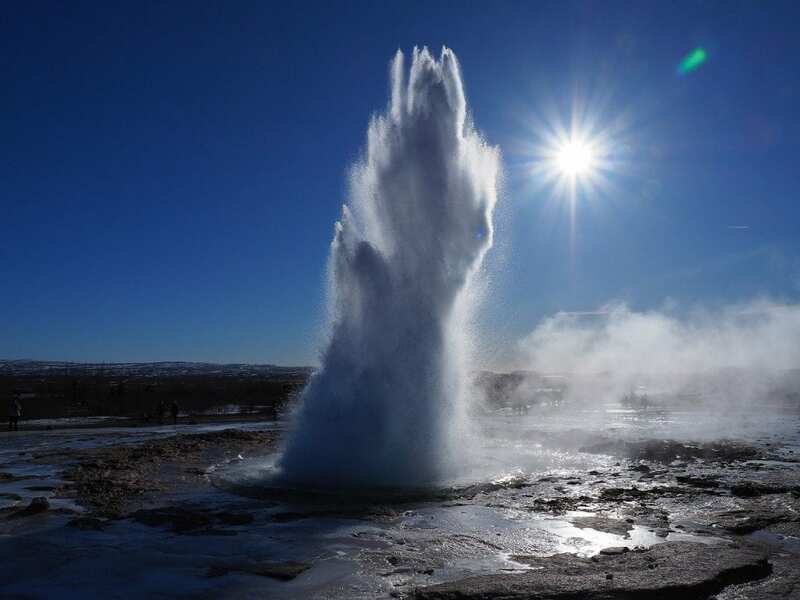 You will drive out of Reykjavík through Norðlingaholt, continue via road 1 over Hellisheiði heath and into Hveragerði, the geyser town! When you are about to reach Selfoss you have two options; one is taking a left turn towards Laugarvatn and continue via road 35, past Kerið Volcanic Crater and Reykholt until making a right turn to road 359 which will take you all the way there. The second option is continuing through Selfoss for about 10 minutes before making a left turn to road 30 through the fertile countryside and all the way to Flúðir where you find the Secret Lagoon. Driving from Vík to the Secret Lagoon will take you along road 1 past Skógafoss and Seljalandsfoss waterfalls, in and out again from the town of Hvolsvöllur and then Hella before making a right turn to road 30 and continuing all the way to Flúðir for a stop at the Secret Lagoon. 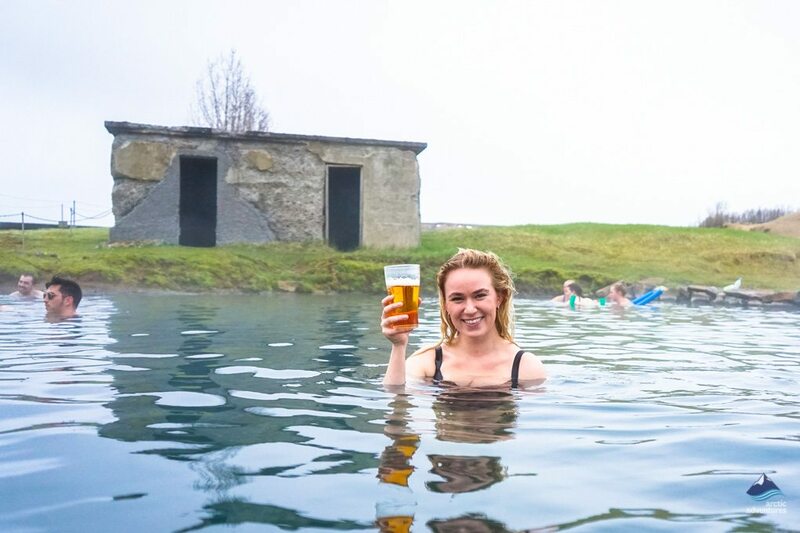 When visiting a pool in Iceland traditions and rules might come as a surprise to you. Here are a few things that a good to know before visiting the Secret Lagoon. You are required to shower naked before entering the pool, completely naked. It is best to stay hydrated and drink well before hitting the pool as the water is very warm. Silver jewelry isn’t recommended in the water. The Secret Lagoon is equally as deep all over, up to the hips or chest for most adults if you stand up. Summer 1st of May to the 30th of September: 10 am to 10 pm. Winter 1st of October to the 30th of April: 11 am to 8 pm. 24th of December: 10 am to 6 pm. 31st of December: 10 am to 6 pm. Note, tickets are sold until 50 minutes before closing time. Litli Fiskikofinn / Secret Fish Cabin – the fish and chips everyone is raving about right next to the Secret Lagoon entrance! Open 12 to 8 pm. Restaurant Icelandair Hotel Flúðir – Restaurant a la carte, an appetizing menu with traditional plates with a modern twist. Open for dinner 6:30 pm to 9 pm. Kaffihus Grund – a great variety and delish food – fantastic reviews! Sindri Bakari & Café – A friendly atmosphere and delightful pastries. Open 9 am to 5 pm. I-C-Food Café and Restaurant – a warm and welcoming café with an interesting pizza menu and the classic Icelandic dishes. Open for lunch Monday to Friday. Minilik Ethiopian Restaurant – an unusual restaurant for the countryside but absolutely delicious. 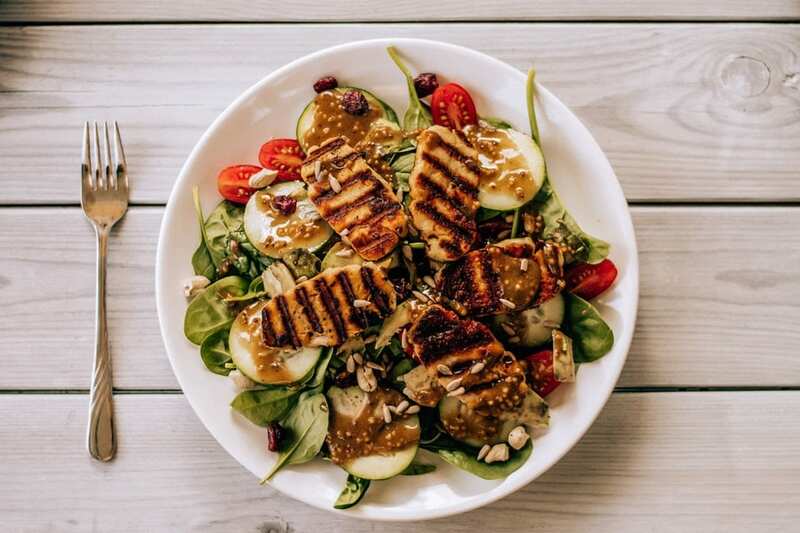 Kaffi-Sel – Fantastic variety and quality vegan options available, located at the golf course. Fludasveppir Farmers Bistro – A yummy mushroom-based restaurant. Flúðir is famous for their veggies and mushrooms so this is the place to try! Open 12 to 5 pm. 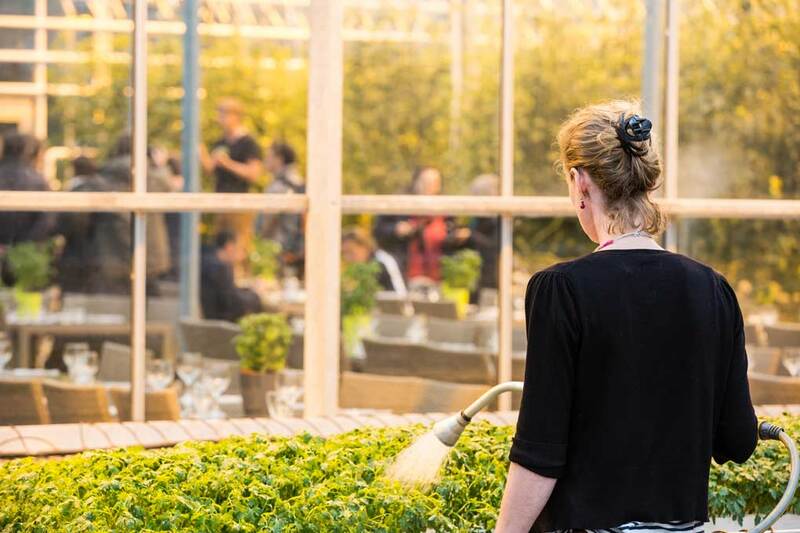 Friðheimar Tomato Farm – a tomato based restaurant, offering everything tomato from soup to beer! Surprisingly good – and they also offer tours around the horse farm and the tomato plantation. Open 12 to 4 pm. 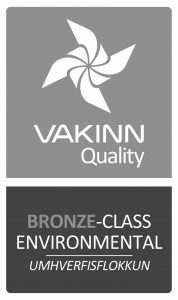 Facilities include running hot and cold water, WIFI (500 ISK – 75 hours), toilets, showers, electricity (1000 ISK per day), washers (300 ISK) and dryers (300 ISK), waste disposals, a restaurant, a sports area, a swimming pool, a hot tub, a golf course, a playground and plenty of walking paths. Price: 1750 ISK per adult per night. Open: 15th of May to the 15th of September. 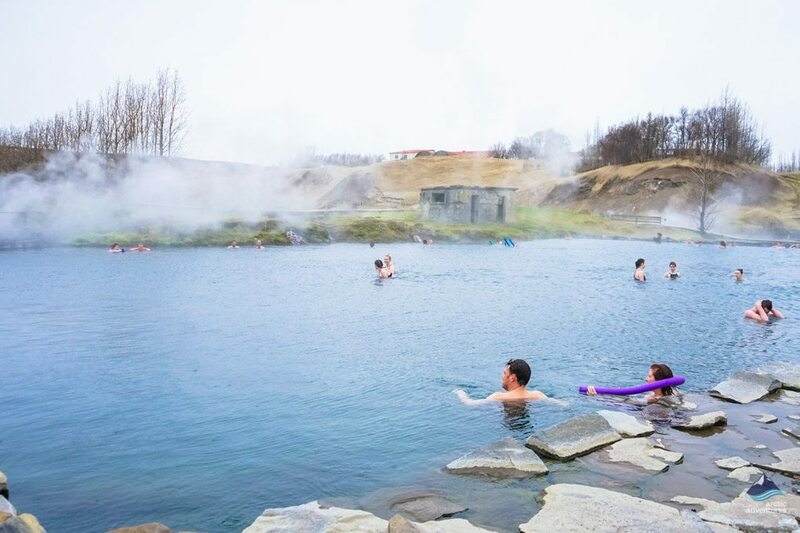 The Secret lagoon is located in one of the most active geothermal areas in Iceland just like the Blue Lagoon but the difference is in the surroundings. The Secret Lagoon is located in a fertile green valley but the Blue Lagoon located in the middle of a harsh lava field. The Blue Lagoon has a unique turquoise blue color, for what it is known for, this is caused by algae and silica, the same as found in the blue waters of Mývatn Nature Baths. The Secret lagoon has more regular clear water. The water in both places is around 40°c (104 Fahrenheit). 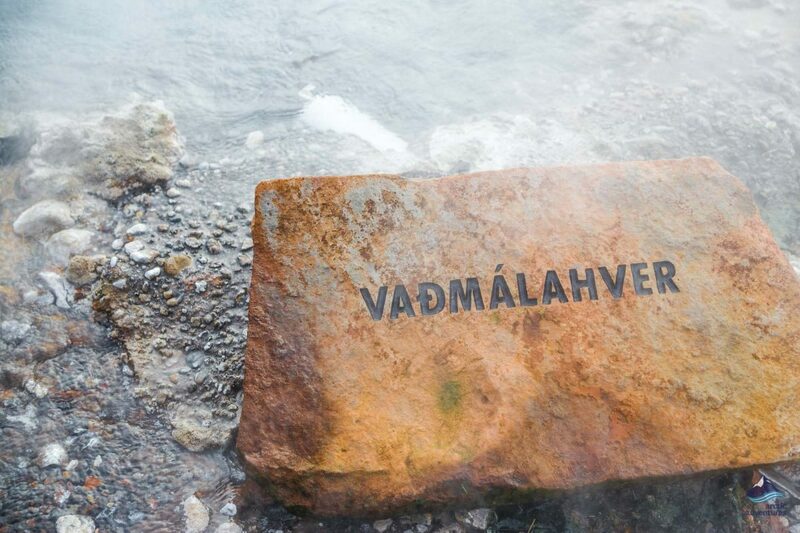 Both places can be visited on a day tour out from the capital, Reykjavík and are unique in their own way. 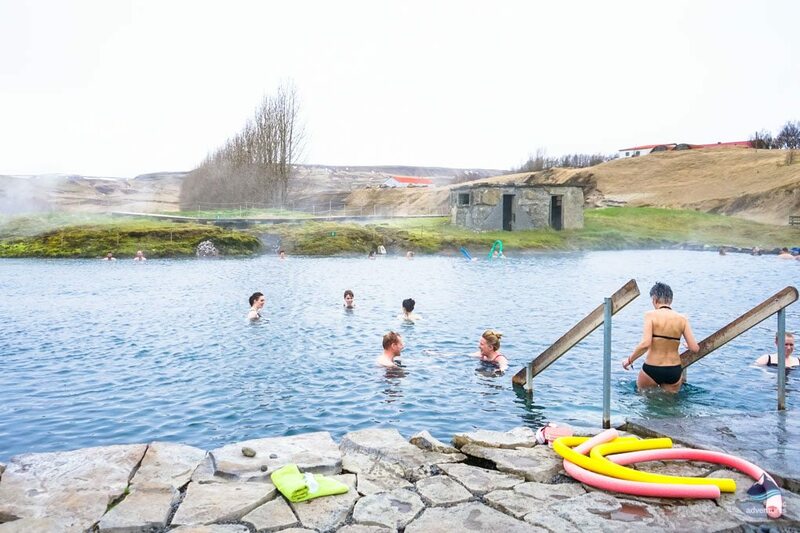 Visiting these places is nothing quite like visiting a regular swimming pool in Iceland and for that reason, the cost is higher. 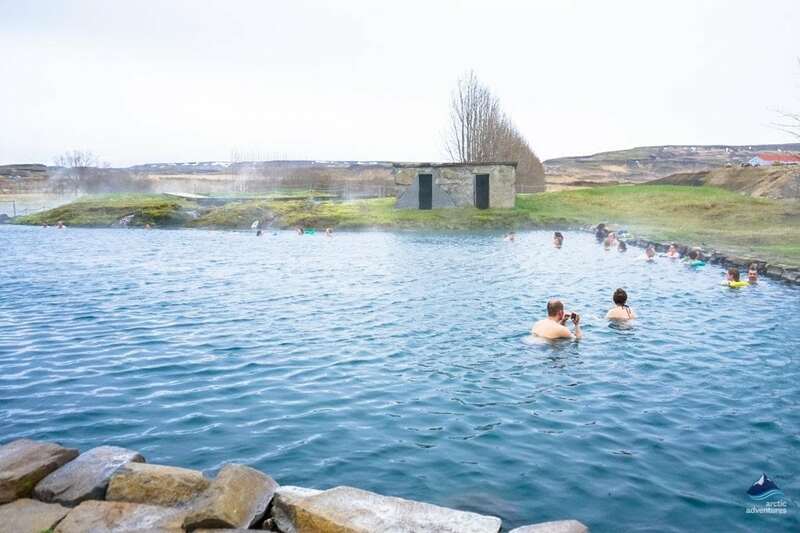 The Blue Lagoon does cost twice as much as the Secret Lagoon (their starting price) but their changing facilities, saunas, restaurants, and steam rooms are also of another sort. 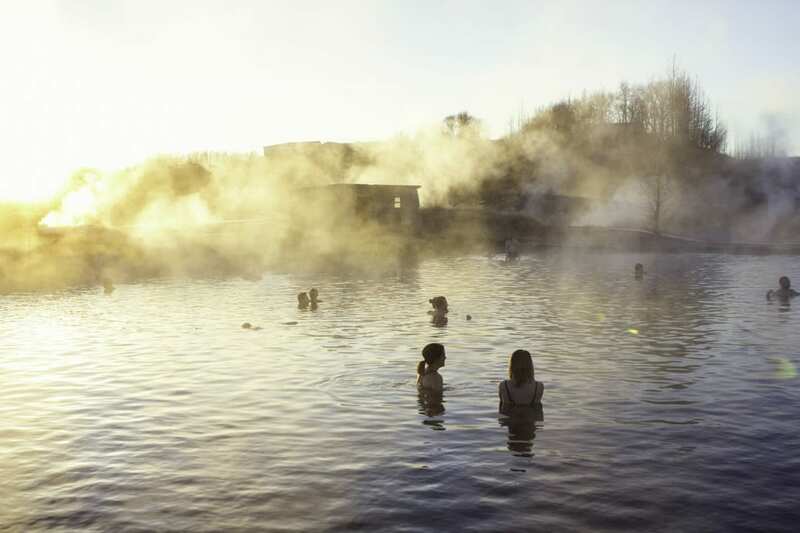 The warm water in the Blue Lagoon is believed to have healing powers for psoriasis and acne. The size of the Blue lagoon compared to the Secret Lagoon is enormous. 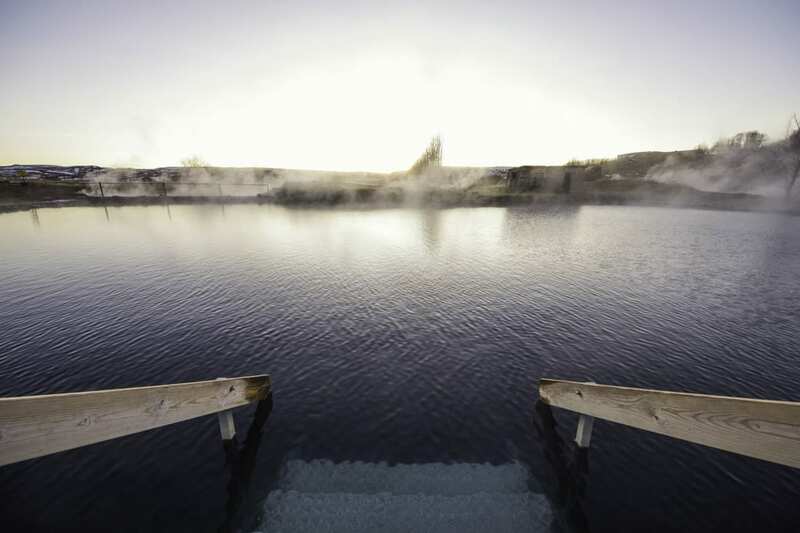 The Blue Lagoon has two hotels, saunas, a steam bath, and a few different geothermal pools. They have a cafeteria and a fancy restaurant, a gift shop with their own skin line. The Secret lagoon has one pool and a cafeteria. 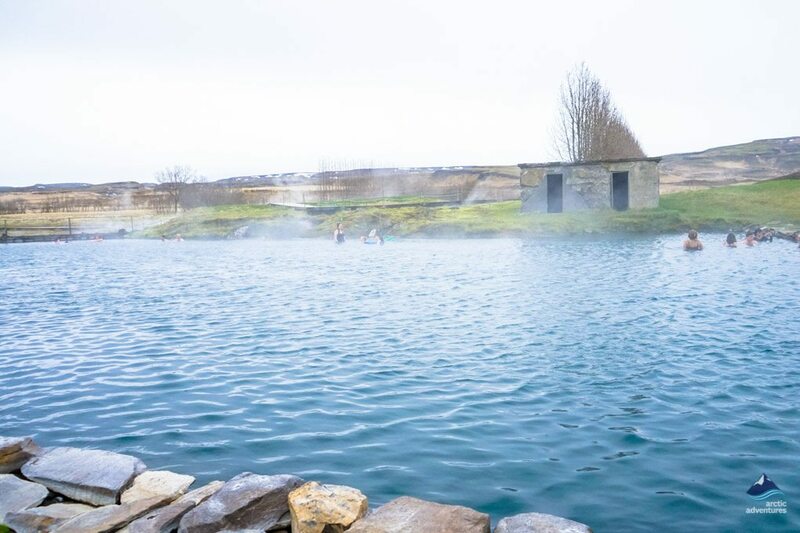 The history of the Secret Lagoon goes back to 1891 the Blue Lagoon was founded in 1992 when the lagoon was moved away from the Geothermal Energy plant. It is quite hard to compare these two, they truly are nothing alike. The Blue Lagoon is more of a spa and has the facilities for you to stay a whole day or two, there you can get treatments and fancy meals and they even have luxury hotels. The Secret Lagoon is a charming small pool, a lot more low key and local. 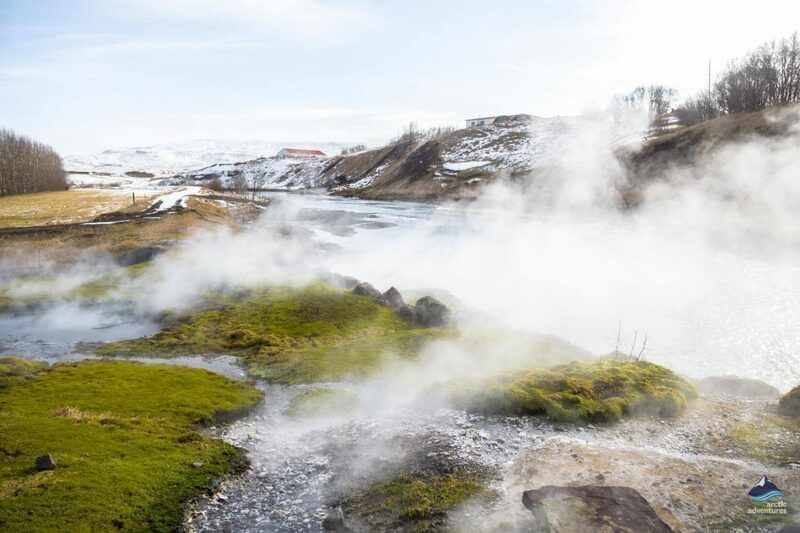 The experience as a whole is not longer than 1-3 hours but is a fantastic extra stop to make on the Golden Circle or with other activities in South Iceland. The difference is so great a visit to both is advised! The mixture of hot fumes from the surrounding springs and the crisp winter air is sublime. Enjoying a soak in the hot water with the surrounding smoke rising in the cold atmosphere all around you and the tree branches covered in sparkly frosted ice will be a moment you remember. 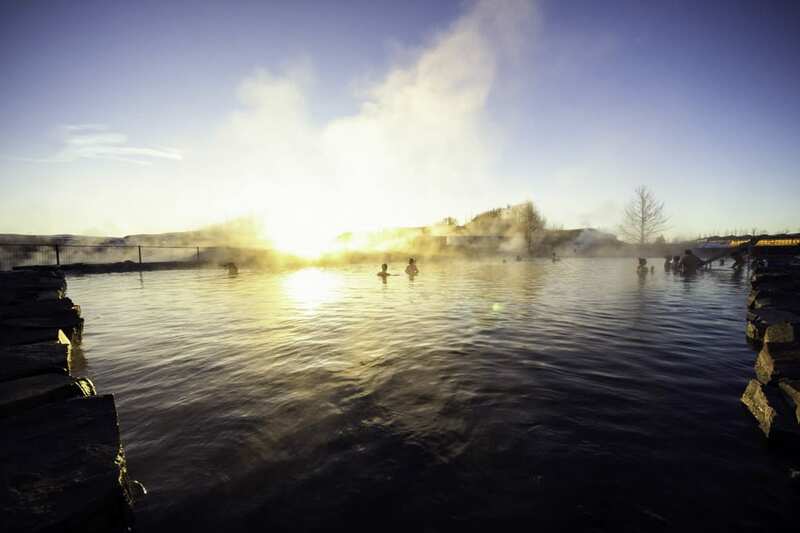 Hot spring bathing is even more of an experience in winter as you can really tell that the natural warmth is genuine staying at a comfortable bathing temperature even during the coldest months! If you are doing a self-drive excursion to the Secret Lagoon check the road conditions before heading out and if you aren’t used to driving in Nordic winter road conditions you might want to consider altering your plan to a guided tour. 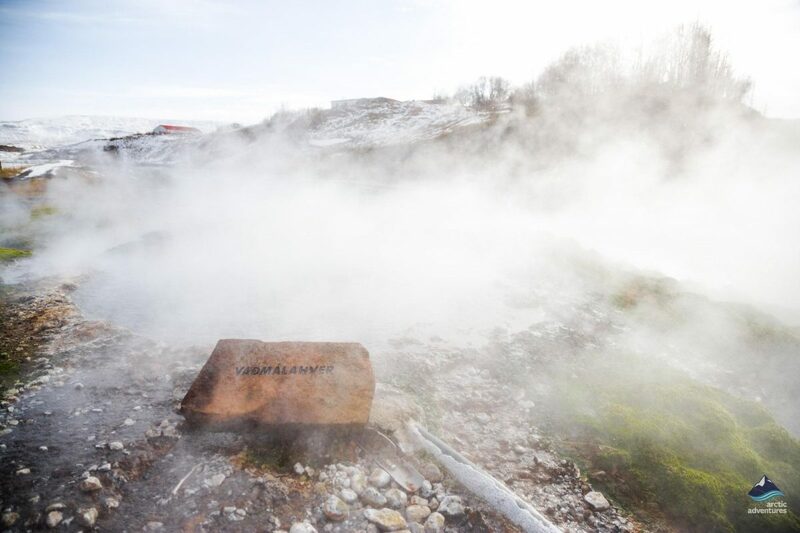 Our Golden Circle and Secret Lagoon Tour from Reykjavík is the perfect tour for those who want to combine history and nature with relaxing hot spring bathing! Visit Þingvellir (Thingvellir) in Þingvellir National Park, site of one of the oldest democratic parliaments in the world. Marvel at the unique geology, where the Eurasian and North American tectonic plates have been slowly moving apart creating a rift valley. Visit the renowned hot spring area around Geysir, stand well back and watch Strokkur erupt. Enjoy the sheer power and majesty of Gullfoss, listed in the top ten by World of Waterfalls. Finally, crown your day with a relaxing bath in a warm geothermally heated pool surrounded by magnificent nature. Another way of doing the Secret Lagoon, in a mixture with a Jet Boat ride up the Brúarhlöð Canyon of the famous Gullfoss waterfall. 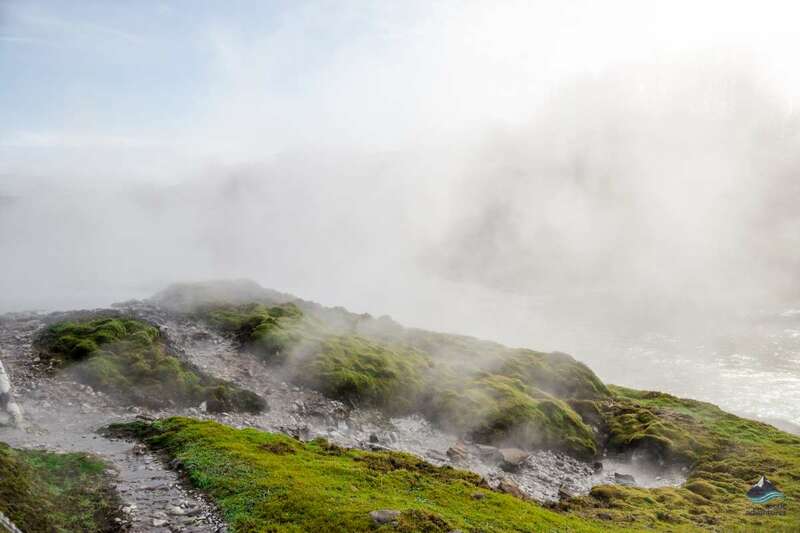 Splash up against the stream on a full-throttle adventure in some of the most stunning areas of Iceland before soaking in a wondrous thermal pool. The perfect yin and yang tour! The Secret Lagoon is also a visit on some of our best multi-day tours. You can find those options by scrolling down the page. 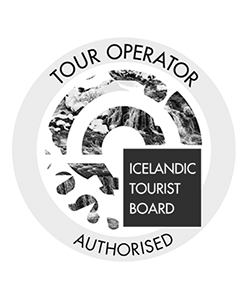 This tour is a winning combination with activities such as the Golden Circle, the Secret Lagoon, Ice Caving, Jökulsárlon Glacier Lagoon and more. 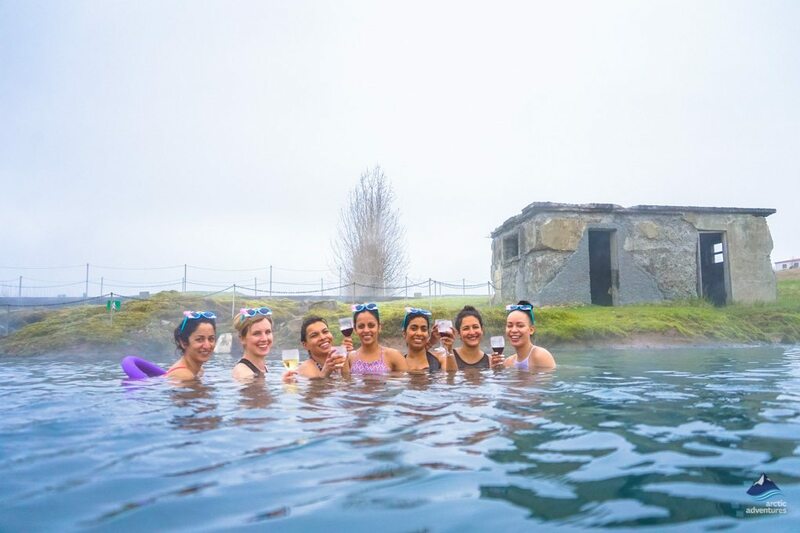 Ride the Hvítá rapids in a Jet Boat and bathe in the relaxing Secret Lagoon on this fantastic tour where ultimate excitement and great serenity meet! Visit Langjökull Glacier for an exhilarating snowmobile ride and take a soak in a natural hot spring located in the small village of Fludir.